Dowel screw M10x200 with strip and M8 screw + nut for the Click-Fit mounting system. The dowel screws are used instead of roof hooks to install PV systems on corrugated roofs. The dowel screws with wood- and ISO-thread are manufactured from stainless steel and are supplied in combination with stainless steel bolts and nuts and an adjustment plate. 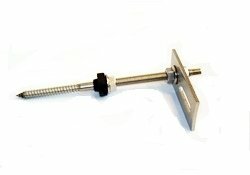 The standard support rail is bolted onto the dowel screws with bolts and nuts from stainless steel.